Right now, you are looking into a space where plasmas are crushed into a torus shape, subjected to a magnetic field, and then heated and pressurized until their nuclei fuse. 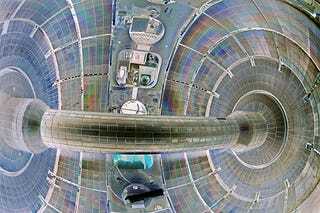 It's called the National Spherical Torus Experiment. This glowing, sideways view of the chamber where plasmas undergo magnetic fusion was taken by Elle Starkman and Charles Skinner of the Princeton Plasma Physics Lab. Check out the exterior and a schematic for the chamber below (yes, several humans could fit inside it). And here's a schematic to give you a better idea of what it looks like. Apparently plasma toroids are all the rage in physics circles right now, so it's time to get rid of all your old-fashioned plasma spheres and ovoids. Also, dear readers, if any physics geeks out there would care to explain the principles of magnetic fusion to us in layperson's terms we'd love to know.